Social Enterprises have raised huge amounts of money for charities and other nonprofits through the sale of products from Tom's shoes to Paul Newman brand food and drink. Many industries have ongoing projects that combine a for profit enterprise with a social benefit. The leading universities in their MBA programs pontificate on the virtues of social enterprise to a very receptive generation of believers. Their Social Enterprise Clubs and internship programs are further evidence that the universities are promoting social enterprise and supporting the creation of innovative business models to meet the increasing need of nonprofits to look outside of their traditional sources of donors. The current economic weakness in the world economy may be the impetus for much of the urgency to find new relationships between commerce and nonprofits, but the greater impetus for this explosive growth of social enterprise may be NECESSITY itself. Governments are notoriously inefficient in managing their institutions and their programs. Add to this the near bankrupt status of so many local, state, and yes, lets include the federal government, and you have all the ingredients for a NECESSITY for something to change. BIG CHANGE !! . Universities, several leading think tanks, and many 'talking heads' are quick to bring up the subject of looking to social enterprise but they do not really constitute the leadership or the ability to bring about this change. What is required is a change of national and international consciousness exactly as has emerged in the face of great environmental danger to our planet. Those who long ago understood the lurking environmental dangers undertook what at first were awkward baby steps to educate and convince people almost one by one to recycle, and outlaw harmful chemicals, and pay attention to carbon emissions, and the list goes on and on. They were successful as evidenced by how much a part of our collective consciousness it has become to respect our planet. This was a monumental shift of consciousness accomplished because of NECESSITY and in a very reasonable period of time when all is said and done. This is precisely what must occur now with the integration of social enterprise into mainstream commerce. One in three people alive today are existing on less than $2 a day. Unsanitary water and the lack of access to potable water is still the leading cause of premature death on our planet at an alarming rate of 42,000 deaths each and every week. Globalization has made us painfully aware of the limited resources available to improve this picture. Granted, animal rights issues locally in the U.S. may seem to some to be a questionable priority when faced with statistics such as these but many feel passionately about this issue and who are we to tell anyone which need in this world they should attach themselves to. I mention this example because many social enterprises leave it up to the individual to choose which cause they want to support and the wisdom of it is that at the community level it is the community members who understand what all of its needs are. What the full range of all these needs have in common is that they are not being met sufficiently with the present resources available to the nonprofits of this world and the public support coming from severely challenged government budgets. And what does NECESSITY say about all of this ? Depending on your point of view we either are, or are not, "our brother's keeper". As a moral issue there is room for any number of opinions. If however it is a practical matter such as saving the planet from environmental suicide, then it needs to concern all of us. Globalization has demonstrated clearly that the consequences of poverty, disease, and despair around the globe effect the quality of life for all of us. Poverty can lead to political instability, hence at least a significant source of the support for terrorists in their homelands. Strictly from an economic point of view the fact that so many parts of the world must spend most all of their resources on the most urgent and basic human needs hinders them from concentrating on building strong middle classes that lead to political stability. Were it otherwise they would be better able to create markets and expand the global economy to the benefit of all. Our 'connectedness' is becoming more and more apparent and the social conditions locally and globally are playing a greater and greater role in the health and well being of all of us. So I would conclude that globalization is already changing our collective consciousness as a planet. And furthermore, that part of this change is an increasing awareness that we need to find innovative ways to help our communities, locally and internationally, become healthy and free from adversities that we have the power to overcome if we have the resources available. All forms of government have policies and dogma as to how to do this. From the Socialists and the Communists to the Democracies and the Dictatorships. How have they done? Not as well as they could have, that is for sure. Politics is politics and each form of government has its own priorities and its own agenda. So I am suggesting here that Social Enterprise is one way of no longer depending on the inefficient and politically motivated forces of government to solve all of our problems. It is time for individuals and businesses to step up to the plate and create innovative ways of marrying commerce and social benefits where they are most needed. As this process unfolds, and I am certain that is exactly what Necessity is driving us to, would you consider this a new form of government? No. It is a new understanding of how to solve social problems locally and globally. This solution has evolved in our collective consciousness as a method to execute what we have identified as being necessary. NECESSITY always speaks to those who are listening. I agree with an interesting article I read in Bloomberg's Business Week that asked if Social Enterprise was the panacea for the Green Economy? "No", was the answer because of the scale in comparison to the need. Okay, let's fix that. Let's increase the scale. If we looked to the political world to do this we would be talking about taxes. Instead let's look to philanthropy and see if there are innovative answers available there. Bill Gates is already doing everything he can to help and so are many other wealthy and socially conscious people. The corporate world has contributed many great ideas with genuine results as a reflection both of their sense of corporate responsibility and also the public relations aspect, as they are increasingly expected to be more "sensitive" and "aware". We know this will not take place at the expense of profits or share price and we should expect no more. There is, however, one area of commerce that has remained up until now almost completely uninvolved in social enterprise and social responsibility and that is commissioned sales people. Real estate agents are the best example and they work with the 'product' that controls more wealth than perhaps any other industry. We believe that it is logical that Realtors can be and should be an enormous resource for raising money for nonprofit organizations and here is why; real estate agents will almost always accept referrals from other agents to whom they pay a referral fee. What if we were to replace referral fees with CLIENT DIRECTED PHILANTHROPY? What if a very large number of real estate transactions in the U.S. were handled by real estate agents who would give a percentage of their commission back in the form of a charitable contribution to the organization selected by their client? Or a referral fee to nonprofits who use their services for direct fundraising ? The effect upon the Realtor would be no different than paying a referral fee to another agent. Imagine the scale of an enterprise such as this if it could be organized and executed. That is precisely the task at hand for REBSEA. There are presently several organizations that exist to give social entrepreneurs a platform from which to express their ideas and to communicate with each other. There are organizations that offer consulting as well as fundraising advise and other services to non profits. None of these are focused specifically on the real estate industry or are they in the position of executing any of their ideas and advise. That is left to leadership coming from within the ranks of people and companies practicing social enterprise in real estate. We accept that role and offer our time and energy to organizing and executing a plan on the scale that is necessary to make client directed philanthropy in the real estate industry a part of our culture and our collective consciousness. With your support we can make this a common practice within a reasonable time frame. The opportunities available to real estate agents and business brokers to grow their businesses by appealing to socially conscious consumers are enormous. If you had three brands of any product to choose from and one of them made a significant donation to a worthy cause which would you choose? A 2008 Behavioral study conducted by Cone/Duke University found that 79% of Americans will switch brands to support a cause they believe in. Imagine if a significant percentage of Americans were aware that they had this option when buying or selling a property or a business. AND IT IS FREE !! It is paid for by socially conscious professionals who willingly give back part of their commission. We have established and will continue to expand our network of capable and experienced agents who will participate in this business model. We call this business model a win-win-win. The socially conscious client gets to support their favorite nonprofit organization with a significant donation. The nonprofit gets a donation they would otherwise not have had plus increased visibility and exposure to new donors. And the real estate agent receives excellent publicity, attracts business that he might otherwise not have had, and ends up being the one making the actual contribution in the form of a reduced commission. That part of their commission is paid in a fulfilling and personally rewarding experience. This is exactly what we are doing. We are creating and executing a business model that establishes a referral network with the referral fee going directly to the nonprofit selected by the client. Why would someone NOT do this if they have this option? Word is spreading quickly. The response has been fantastic. Many realtors and business brokers have joined our network who are truly excited at this innovative way to give back to the community. 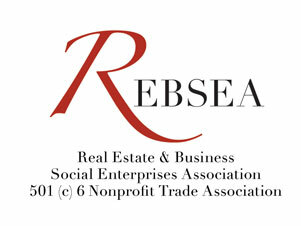 Supporters of nonprofit organizations working directly with REBSEA can use our network to buy or sell a property or business anywhere in the country. If we do not have a member in their specific location we will find an agent who the client is completely satisfied with and make that agent a REBSEA member at the same time. This is an innovative method of fundraising for nonprofits who are being forced to look outside of traditional sources for funding their programs. The "New Normal" economy looks like it will be with us at least for the foreseeable future and with it the need to expand our thinking and reassess our priorities. Most Americans have already done this to some degree and find that they need to continue to do so. It is forcing us to be more efficient, less wasteful, and more pragmatic in our personal lives and so it must do so in the larger picture of how we run our country and how we approach finding solutions to community and global challenges. Introducing social enterprise into the real estate industry can make a significant contribution if it can be done on a scale with true impact. Size matters, especially the size of our commitment. Please join us by supporting REBSEA. By joining as a PEOPLE MEMBER you will receive our newsletters and blogs and be able to watch social enterprise evolve as it transforms commerce as we know it today into what NECESSITY is telling us needs to happen. We will keep you informed of what is going on in all of the many social enterprise initiatives locally and around the globe. We believe that the business community should consider that this is not a fad, it is a trend, and it is the shape of things to come.